SCHENECTADY, New York -- Tucked in the pages of a grimy, leather-bound almanac in the archives at New York's Union College was a tiny envelope with the hand-scrawled words "Washington's hair." 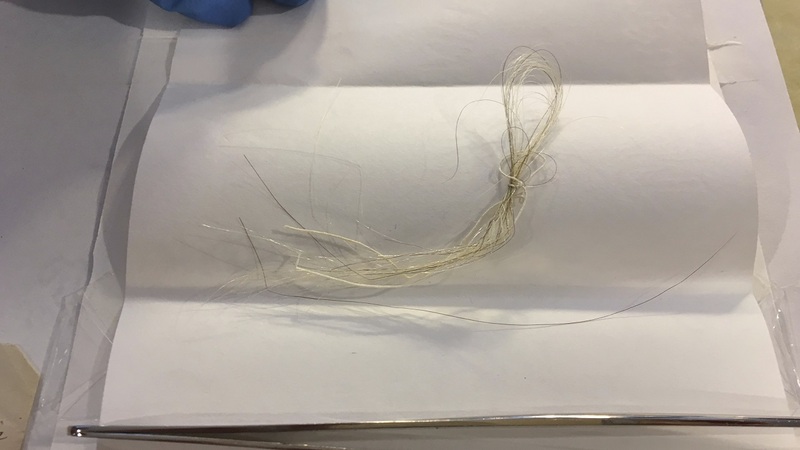 A librarian who had been cataloging old books gingerly opened the yellowed envelope to find a lock of silvery hair tied with a thread. "It was one of those mind-blowing moments that happen every once in a while in a librarian's life," said John Myers, a catalog and metadata librarian at the college. "I thought, that doesn't mean George Washington, does it?" While college officials can't say for sure it's the real deal, the historical evidence is there. The hair was discovered in a pocket-sized almanac for the year 1793 that belonged to Philip J. Schuyler, son of General Philip Schuyler, who served under Washington during the Revolutionary War and founded Union College in 1795. Susan Holloway Scott, an independent scholar and author, said locks of hair were frequently given as gifts during Washington's day and it's likely Martha Washington gave the snip of her husband's hair to Eliza Schuyler, daughter of the general and wife of Alexander Hamilton. Eliza passed it on to her son, James A. Hamilton, as noted by the handwriting on the envelope: "from James A. Hamilton given him by his mother, Aug. 10, 1871." A prominent collector of celebrity hair believes it's truly a relic of the nation's first president. "There's no doubt in my mind it's genuine," said John Reznikoff, founder of University Archives in Westport, Connecticut. And Reznikoff knows hair. His personal collection of 150 locks includes a brain-speckled strand plucked from Abraham Lincoln's fatal wound, a voodoo charm made from Jimi Hendrix's hair and sartorial samples from Albert Einstein, John F. Kennedy, Napoleon, Marilyn Monroe and, of course, George Washington. India Spartz, head of special collections and archives at Union, called the hair "a very significant treasure" that will eventually be displayed at the liberal arts college. Reznikoff said hair locks are typically authenticated through examination of associated artifacts and historical connections rather than by DNA testing because genetic tests aren't always reliable without the hair's root attached and the possible contamination of DNA from multiple people who likely handled the hair. "Most hair locks stand or fail on the basis of written provenance," Reznikoff said. "So one needs really to consult with document experts rather than scientists." For librarian Myers, he's still coming to grips with what he found during an otherwise mundane December day. "It's not nearly as significant as finding some obscure medieval manuscript from some important author," he said. "But in the context of a small upstate college, this is, like wow! Kind of exciting!"